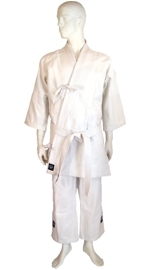 Karate uniform 8oz+ is suitable for light summer uniform or fighting style jujutsu - it has long sleaves. All seams are atleast with 3 rows of stiching. 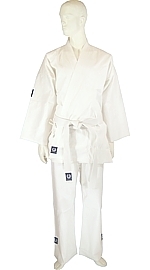 Roku uniform is used by many experienced jujutsuka wiht the basic training as light weight uniform, which is durable, soft and suitable arm length for weapon tehniques. Collars are soft and easy to hold in various techniques. Gusseted crotch for easy movement. Snair and rubber attachment. Double knee. White belt comes with uniform. 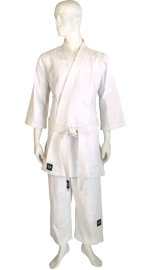 We recomend also San uniform for jujutsu. It has laces also on chest, so it is easy to keep closed. It has a reinforsed soft collar. 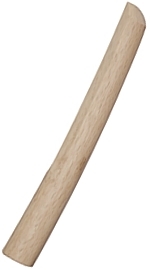 Sleaves are same fabric with the torso so it durable for tearing. Pants are with tradional lace attachment. Double fabric on legs from thights to down. 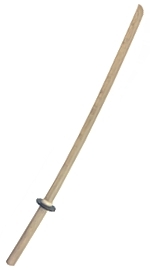 various styles has weapons in jujutsu which we have broad selection. You can aquire special weapons via e-mail which we do not have on selection. 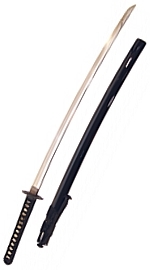 we recomend durable sword #60020 and similar shorter #60021 for jujutsu. 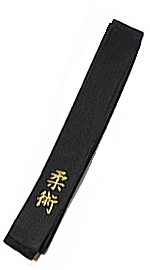 You can aquire sharp 'nihonto' from Japan via us. 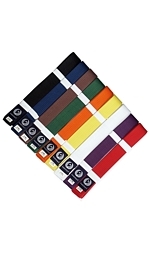 Our budo belt has many colors and sizes available. 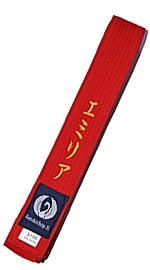 You can have your belt with embroidery - name and/or style with letters, kanji or katakana characters. Ebroidery is done in Turku store and you do not need to know how to spell your name with japanese characters while making the order. We will help with spelling. 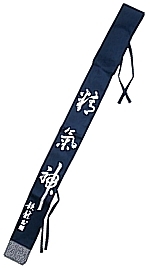 Some jujutsu styles has hakama with soft back plate (koshi-ita). 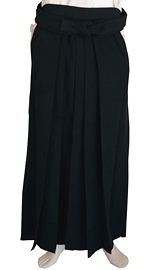 Meijin Budoshop has balck and blue Aikikai hakama or economical AH1 hakama for jujutsu. 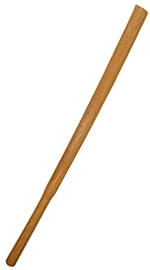 If your AH1 hakama comes with a plasting spoon, we recomend to remove it, cause it might cause injury to your back if it is not propely attached. Aikido hakama has long front laces. Yoi´can aquire special hakamas, jacket and laces for celebration aóutfiths - many color options available. 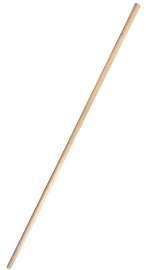 You can use suburi bokken for training muscles and sword techniques.